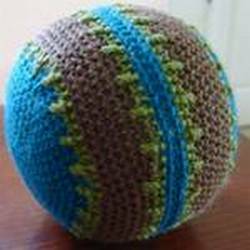 A lovely, soft ball to crochet for toddlers to throw and roll safely. Ball is made with two halves. This project is crochet using rounds. You will need to mark your stitches to keep your place. To help keep track, place a stitch marker at the beginning of the first round, then slip the marker when you come to it on each round. I like to use a safety pin to mark my rounds. I also suggest using a pencil and note pad or a row counter to keep track of the rounds you have worked. Turn the halves with right sides together and whip stitch the halves together. Leave a small hole to turn the piece and to stuff. Stuff the ball and stitch hole closed.